There is a chocolate-coated graham cracker and crème cookie and a sandwich cookie with chocolate and marshmallowy goodness filling. Both are, true to form, called "S'mores." The Girl Scouts have a strong tie to s'mores and the gooey treats are referenced as early adopters of the "Graham Cracker Sandwich" in a 1920s Campfire Marshmallows Cookbook. The recipe for "somemores" was published in the company's 1927 book, "Tramping and Trailing with theGirl Scouts;" a 1938 tome marketed toward summer camps calls the treat "s'mores;" and the rest is sticky, chocolatey, burnt marshmallowy history. 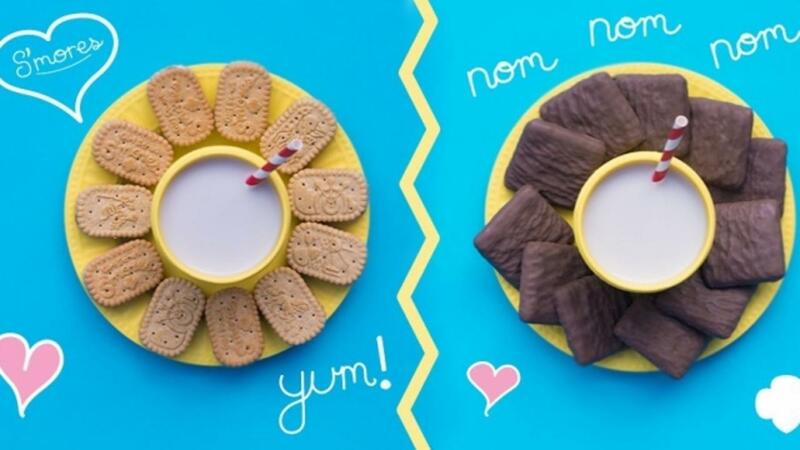 Girl Scouts of the USA Director of Communications Stewart Goodbody tells Mashable, "We are sure to see some "Triple Decker S'mores" out there come cookie season where extreme s'more-ers use two Girl Scouts S'mores Cookies to sandwich a toasted marshmallow."